Bauerfeind CaligaLoc Stabilizing Ankle Brace from HealthyKin.com is used to quickly and easily stabilize the entire ankle giving both medial and lateral support. CaligaLoc provides excellent ankle stabilization by counteracting supination (the outward rolling of the ankle) and preventing abnormal loads in the upper ankle. Can be worn around the clock, as a support splint in normal shoes during the day and as a positioning splint without shoes at night. Provides support of the foot in dorsiflexion. Keeps your ankle stable even if you have moderate foot drop and instability. Unlike stirrup supports, CaligaLoc stabilizes the ankle even when you are not wearing a shoe. I guess you could say it does somewhat immobilize the ankle, but I couldn’t get it snug enough to stay in one position, so it shifted back and forth while I walked. Because of the rubbing back and forth it caused rashing on my skin, even through my sock. Then I tried to return it and was informed there are no refunds. Buyer beware. Strapping is ALLLLLLL wrong and needs a new design. Also, should have read the reviews and I would have seen that they do not provide refunds for poorly made equipment. 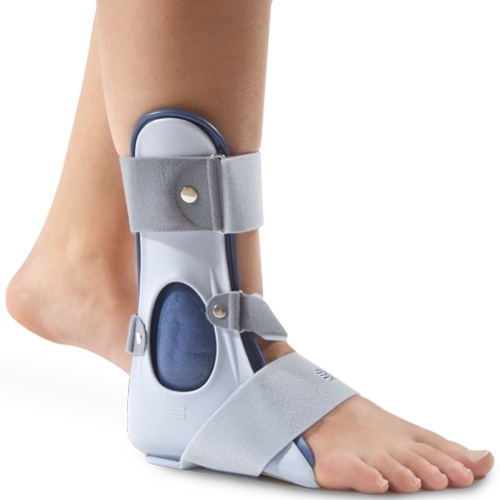 I work as an occupational therapist and I was very disappointed in the construction of this brace. You would be better off having a custom made AFO to meet the needs of this brace.